Based on the 1996 movie starring Bill Paxton and Helen Hunt, this indoor, walk-through attraction allows you to experience the creation of a real-life tornado right before your very eyes and ears. 4 out of 5. High rating because the tornado sequence is very loud. If you ever see a wait time longer than 10 minutes, call me. The end sequence demonstrates what happens when a tornado strikes the small town of Wakita, Oklahoma. Like Terminator 2 3D: Battle across Time, there is a boom at the end! Bill Paxton and Helen Hunt refused to be in the same room when the pre-show video was being filmed for this attraction (who knows what they were fighting about). If you pay attention, you will notice that they are never in the same camera shot. 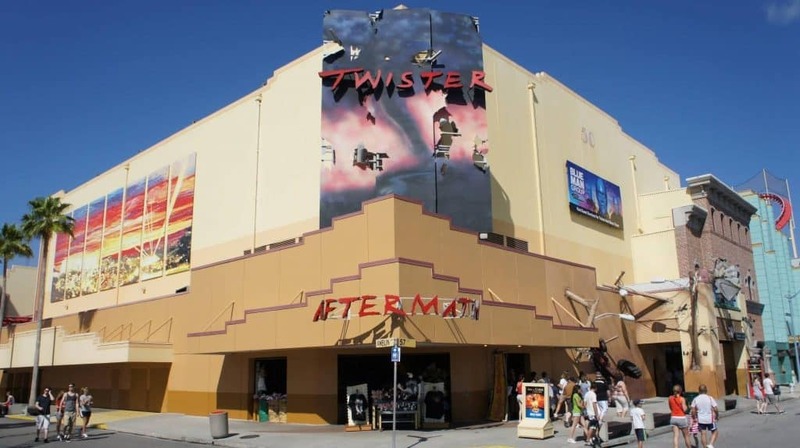 Dated, limited, and best known for its cheesetacular intro video instead of the technical wizardry of its actual experience, Twister: Ride It Out was among the first attractions on Universal’s chopping block once The Wizarding World of Harry Potter – Diagon Alley was completed.